Dressage (/ˈdrɛsɑːʒ/ or /drɨˈsɑːʒ/; a French term, most commonly translated to mean "training") is a competitive equestrian sport, defined by the International Equestrian Federation "FEI" as "the highest expression of horse training", where "horse and rider are expected to perform from memory a series of predetermined movements." Competitions are held at all levels from amateur to the World Equestrian Games. Its fundamental purpose is to develop, through standardized progressive training methods, a horse's natural athletic ability and willingness to perform, thereby maximizing its potential as a riding horse. At the peak of a dressage horse's gymnastic development, the horse will respond smoothly to a skilled rider's minimal aids. The rider will be relaxed and appear effort-free while the horse willingly performs the requested movement. Dressage is occasionally referred to as "Horse Ballet." Although the discipline has ancient roots in Europe, dressage was first recognized as an important equestrian pursuit during the Renaissance. The great European riding masters of that period developed a sequential training system that has changed little since then. Classical dressage is still considered the basis of modern dressage. 1. 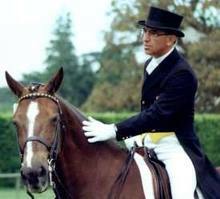 The object of dressage is the development of the horse into a happy athlete through harmonious education. As a result, it makes the horse calm, supple, loose and flexible, but also confident, attentive and keen, thus achieving perfect understanding with his rider. 2. The freedom and regularity of the paces. - The harmony, lightness and ease of the movements. - The lightness of the forehand and the engagement of the hindquarters, originating from a lively impulsion. - The acceptance of the bridle, with submissiveness throughout and without any tension or resistance. 3. The horse thus gives the impression of doing, of his own accord, what is required of him. Confident and attentive, submitting generously to the control of the rider, remaining absolutely straight in any movement on a straight line and bending accordingly when moving on curved lines. 4. The walk is regular, free and unconstrained. The trot is free, supple, regular, and active. The canter is united, light and balanced. The hindquarters are never inactive or sluggish. They respond to the slightest indication of the rider and thereby give life and spirit to all the rest of his body. 5. By virtue of a lively impulsion and suppleness of the joints, free from the paralysing effects of resistance, the horse obeys willingly and without hesitation and responds to the various aids calmly and with precision, displaying a natural and harmonious balance both physically and mentally. 6. In all the work even at the halt, the horse must be “on the bit”. A horse is said to be “on the bit” when the neck is more or less raised and arched according to the stage of training and the extension or collection of the pace, accepting the bridle with a light and soft contact and submissiveness throughout. The head should remain in a steady position, as a rule slightly in front of the vertical, with a supple poll as the highest point of the neck, and no resistance should be offered to the rider. 7. Cadence is shown in trot and canter, and is the result of the proper harmony that a horse shows when it moves with well-marked regularity, impulsion and balance. Cadence must be maintained in all the different trot or canter exercises and in all the variations of these paces. 8. The regularity of the paces is fundamental to dressage. 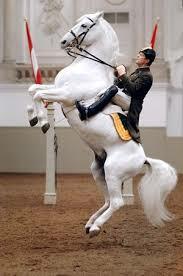 Lippizaner Stallion from Spanish Riding School demonstrating High School Movement "Courbette"